All the bones in the body can be described as long bones or flat bones. Long bones are those that are longer than they are wide. The end of the long bone is the epiphysis and the shaft is the diaphysis. When a human finishes growing these parts fuse together. The outside of the flat bone consists of a layer of connective tissue called the periosteum. The interior part of the long bone is the medullary cavity with the inner core of the bone cavity being composed of marrow. Flat bones have broad surfaces for protection or muscular attachment. Flat bones are composed of two thin layers of compact bone that surround a layer of cancellous (spongy) bone. In an adult, most red blood cells are formed in the marrow in flat bones. endosteum: A thin vascular membrane of connective tissue that lines the surface of the bone tissue that forms the medullary cavity of long bones. medullary cavity: The medullary cavity, also known as the marrow cavity, is the central cavity of bone shafts where red bone marrow and/or yellow bone marrow (adipose tissue) is stored. diaphysis: The central shaft of any long bone. epiphyseal plate: A hyaline cartilage plate in the metaphysis, located at each end of a long bone where growth occurs in children and adolescents. Bones support and protect the body and its organs. They also produce various blood cells, store minerals, and provide support for mobility in conjunction with muscle. Bone is made of bone tissue, a type of dense connective tissue. Bone (osseous) tissue is the structural and supportive connective tissue of the body that forms the rigid part of the bones that make up the skeleton. Overall, the bones of the body are an organ made up of bone tissue, bone marrow, blood vessels, epithelium, and nerves. There are two types of bone tissue: cortical and cancellous bone. Cortical bone is compact bone, while cancellous bone is trabecular and spongy bone. Cortical bone forms the extremely hard exterior while cancellous bone fills the interior. The tissues are biologically identical but differ in the arrangement of their microstructure. Osteocytes and osteoclasts: These are involved in the reabsorption of bone tissue. The mineralized matrix of bone tissue has an organic component—mainly made of collagen—and an inorganic component of bone mineral made up of various salts. 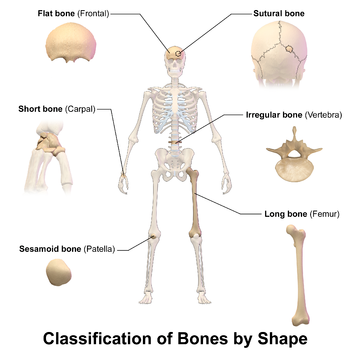 Bone types: This image show the different bone classifications, based on shape, that are found in a human skeleton. These are flat bone, sutural bone, short bone, irregular, sesamoid bone, and long bone. Long bone: A long bone is longer than it is wide. Growth occurs by a lengthening of the diaphysis. located in the center of the long bone. Legs: The femur, tibia, and fibula. Arms: The humerus, radius, and ulna. The clavicles or collar bones. The outside of the bone consists of a layer of connective tissue called the periosteum. 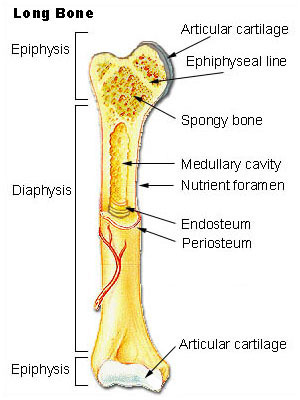 The outer shell of the long bone is compact bone, below which lies a deeper layer of cancellous bone (spongy bone), as shown in the following figure. The interior part of the long bone is called the medullary cavity; the inner core of the bone cavity is composed of marrow. Short bones are about as wide as they are long. These provide support with less movement. Examples of short bones include the carpal and tarsal bones of the wrist and feet. They consist of a thin layer of cortical bone with cancellous interiorly. Compact bone and spongy bone: The hard outer layer of bones is composed of compact bone tissue, so-called due to its minimal gaps and spaces. Its porosity is 5–30%. Inside the interior of the bone is the trabecular bone tissue, an open cell, porous network that is also called cancellous or spongy bone. Flat bones are broad bones that provide protection or muscle attachment. 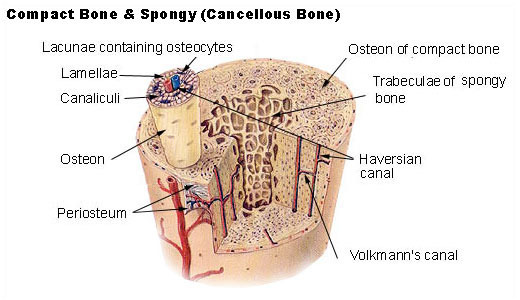 They are composed of two thin layers of compact bone surrounding a layer of cancellous (spongy) bone. Sesamoid bones are smaller bones that are fixed in tendons to protect them. An example is the patella (knee cap) located in the patellar tendon. Other examples include the small bones of the metatarsals and the pisiform bones of the carpus. The irregular bones are named for their nonuniform shape. Examples include the bones of the vertebrae. These typically have a thin cortical layer with more cancellous bone in their tissue.